So it’s obvious from my title that this is something very few if none would dare do in Metro Manila and that is to plant strawberry mother plant / runners in a pot and see if it will grow in hot urban condition. 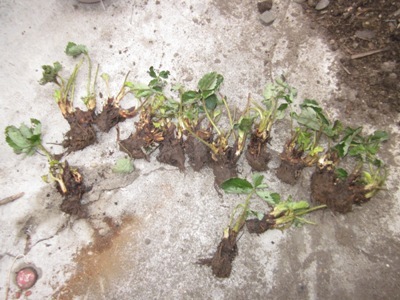 The mother plant which we are going to plant are those that came from Baguio Strawberry Farm in La Trinidad, Benguet. It’s cold there compared to Manila weather and if this doesn’t work, then all future investments in time to plant and propagate organic strawberry in Manila would definitely close down and other options and experiments will soon continue to be done. 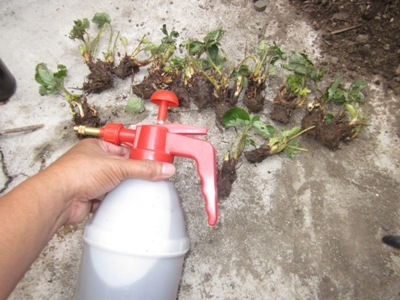 We all know that seasons play a big role in planting and propagation of any kind of fruit-bearing plants and strawberry is one of them although I heard that you can literally grow them any season of the month, they would usually grow better during December or Christmas season when the air is cold. In Baguio however and that includes Benguet from which our mother plant to be used for experiment will come from, it is cold the whole year through. 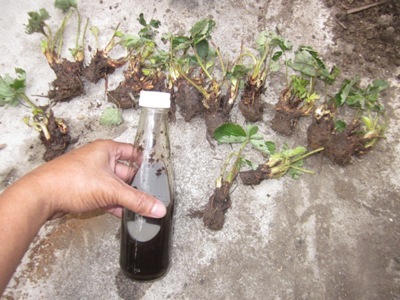 We came home from a trip to Baguio and we brought home cheap strawberry planting materials for this experiment. In case you did not know it yet, you cannot buy these planting materials in Manila but our family, my father particularly found a way to get some at the cheapest price imaginable for me which is at Php 50.00 pesos for more than 20 separated mother plants. Quite cheap eh but for this experiment, time is definitely not on our side because it’s summer month of April and no rain is to be expected yet which we though would be a bit perfect except for the hot sun. Strawberries are known to dislike rain. Their fruits get destroyed and get rotten easily when they are exposed to too much rain according to the strawberry farmers in la Trinidad, Benguet. Using dried palmera leaves for our soil mulch. Yes, from the time we found out that using mulch would be beneficial to plants, from then on, we decided to use one in most if not all our planting spree here in our backyard and this time, we are using something different. This could be another factor yet but then again, we are not hoping for positive results to this experiment, we just want to have fun learning what works and what doesn’t in our small backyard gardening farm. Anyway, we were able to prepare for you a few pictures of how the mother plant looks like as well as the planting pots that we will use. 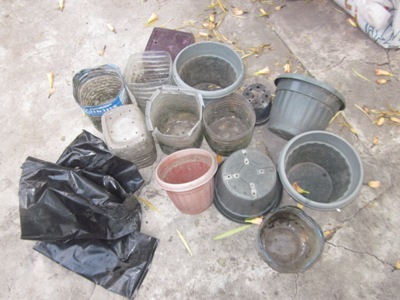 Remember not to comment on our pots because as you may very well know, most of the time, we do recycling of old pots, trellis and plastic gallons to use for our sustainable backyard organic farming style in Manila. Just enjoy taking a peek at our pictures so you have a clue how we will do it and if this experiment will be a success, we don’t know yet. We are not optimistic over this, we just want to find out if it will work somehow. This is an extreme investment knowing that the season once again is not on our side. We’ve prepared all the materials to use for our experiment and made a few research by asking the farmers regarding their personal experience with its propagation back in Benguet so we know what strawberry plant favors apart from the cool weather. According to them, the plant hates too much moisture. This leaves us to prepare a less moisture retaining soil mixture. 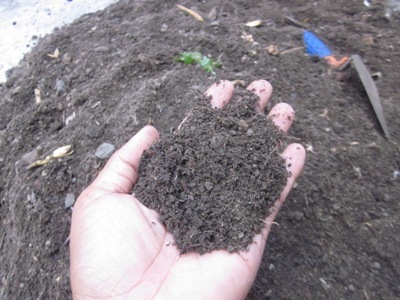 In this case, we used 10% vermicast, 80% sandy loam soil and 10% of coconut coir dust (ground dried coconut husks). The purpose of this mixture to let moisture or water flow freely down more so the medium will be less wet. The next step in making sure that the mother plant will grow stronger and better is to spray it out with prepared FPJ or fermented plant juice, a concoction we made out of a series of video tutorials we’ve watched from Sandy Itchon, representative of Sunshine Chicken organic poultry farm in the Philippines. After spraying the remaining roots of the mother plant, we’ve transplanted the strawberry planting materials immediately to the pots with prepared soil enough for the plant so that we could cover it up with a little more soil later and then above it, the dried palmera leaves mulch. 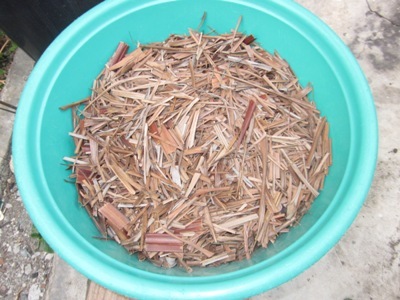 You will notice that we used a type of mulch that retains water a little bit less than dried straw, peet moss or dried grass. The purpose again for this is to lessen moisture retention and have just enough water maintained on our soil for the new plants not to dry out in the hot summer weather in Manila. After transplant of the mother plants, we covered them with enough volume of dried palmera leaves mulch and then we placed the new transplants in a covered area where the sun won’t get a headshot of the plants yet. This is standard procedure (SOP) for all new plants. After a week, we will see if anything happens or if we will have a good result. Will be posting updates as soon as there are good or bad news.